The Certificate of Excellence is a yearly honor that aims to recognize Malaysian insurance and takaful agents who have consistently gained top-notch reviews from their existing customers as a testament to the quality of service offered and professionalism displayed. One of iBanding’s core objectives is to empower the Malaysian consumer by providing them with the knowledge and awareness about insurance, as well as offer them the best solutions in all things insurance. We would like to contribute in improving the industry’s level of service by making sure that agents are not only recognized, but awarded for their dedication. This includes offering Malaysians the power to choose only the best insurance and takaful agents who have been rated highly by their clients. The Certificate of Excellence is in a class of its own, whereby no other recognition of similar standard and purpose exists in the country today. Unlike Agency Awards that are given out by insurance companies to their own top agents based on sales, the Certificate of Excellence reflect the agents’ true dedication and service quality offered to their customers. Agency awards reward agents for their salesmanship, whereas the Certificate of Excellence is an independent award given out to agents not based on sales figures, but solely based on current and actual customer feedback. The Certificate of Excellence is the first of its kind in Malaysia where agents will be awarded for their outstanding professionalism and services to their customers. The award is given based on actual customer online reviews and ratings of their experience in dealing with the agents and it takes into consideration the quality and quantity, as well as recency of the reviews submitted by their customers onto iBanding’s Insurance and Takaful Agent Directory. And finally, research by Reevo found that reviews produce an average 18% uplift in sales. To the customers, the Certificate of Excellence is a symbol of knowledge, professionalism and service quality of the individual agent. This will help strengthen the trust and confidence that the customer has towards their existing agent. As for potential customers, the COE will help them in identifying credible agents among the thousands of agents in the industry. In 2017, 23 out of 2,100+ insurance/takaful agents or financial advisors received the Certificate of Excellence. In 2018, only 19 out of 3,500 insurance/takaful received the award. Only 1% of the agents fulfilled the requirements making the Certificate of Excellence a unique tool to differentiate yourself from other agents. Click on the badge to find out who received the Certificate of Excellence. To be eligible for the Certificate of Excellence, an agent has to be registered on iBanding’s Insurance Agent Directory, and has acquired a minimum amount of reviews with an overall rating of 4 out of 5 star within the year. See requirement in FAQ section. The digital certificate along with the COE badge will be emailed out to the recipient as and when he meets the minimum requirements of the certification. The COE badge will be placed automatically on their profile on the Agent Directory. This will help the public in identifying the agents who have been recognized for their outstanding service delivery. Any registered insurance agent, takaful agent or financial advisor in Malaysia who has signed up on iBanding’s Insurance Agent Directory and fulfills the minimum requirements is eligible to receive the Certificate of Excellence award. What are the requirements for the Certificate of Excellence? Must be an individual. Not an company or organization. What are qualified reviews and ratings? Qualified reviews and ratings are reviews and ratings received from customers that have been checked and approved by the iBanding team for their authenticity. Once an agent has fulfilled the minimum requirements to receive the Certificate of Excellence, our iBanding quality control team will validate their reviews & ratings to ensure that they are valid and from unique and valid. Agents that have rated themselves or attempted fraud are disqualified from receiving Certificate of Excellence and are blacklisted. How will I know if I am a recipient of Certificate of Excellence in 2019? Once an agent fulfills the minimum requirement, we will notify him via email along with the digital certificate and COE badge. The recipient will also have the option to order the printed certificate from iBanding, and have a photo opportunity for handing over of the certificate. What is the best way to earn the Certificate of Excellence? We encourage all agents to provide best in class service to their customers and continuously review their clients’ need to ensure up-to-date insurance coverage. After each contact with your customers, encourage them to visit your profile on iBanding.com and leave a review for you. This will ensure that you receive continuous feedback from your customers and increases the chance to fulfill the COE requirements. How will I receive my Certificate of Excellence? 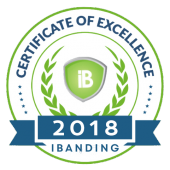 Once you have earned the Certificate of Excellence, you will receive an email from iBanding Support team. iBanding will request further information from you to verify the validity of your listing and your agent/FA license. Once this is done, we will provide you with graphics and online material that you can use to put on your webpage. You will automatically receive a digital badge on your profile picture in the directory.